In 1935, 17 year old aspiring actress Marsha Hunt was discovered in Hollywood. She signed with Paramount Pictures and went on to a flourishing career at MGM. She made 54 films in 17 years before a series of unfortunate events led to her being unfairly blacklisted. After the blacklist, she championed humanitarian causes, forging a career as one of Hollywood's first celebrity activists. She was the FIRST Angelina Jolie. As far back as 1955, Eleanor Roosevelt was a mentor of hers as they both worked tirelessly to support the work that the United Nations Association was accomplishing in this country . At age 96, Marsha continues to fight for causes she believes in. This film is a call to action for activists of all ages. If you're a fan of TCM, you might know Marsha Hunt as a lovely, charming, and very talented young actress of the '30's and '40's (Pride and Prejudice, The Human Comedy, Cry Havoc), and you may well wonder why she never quite attained the "household name" status of some of her contemporaries. This engrossing documentary shows how she never left the movie business, but the movie business shamefully left her. (Like me, you may never again think quite as highly of Humphrey Bogart and John Huston.) Fortunately, in some ways, the movies' loss was the world's gain, as she turned her attentions to many serious causes - hunger, homelessness, promoting greater understanding and cooperation in the world through the United Nations - while continuing to work as an actress on the stage. 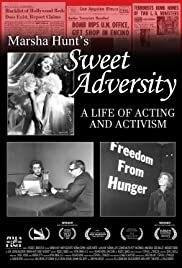 Eleanor Roosevelt became a friend and mentor over the years, and the documentary has comments from many well-known admirers attesting to Marsha's eloquence and persuasiveness on behalf of good causes. The screening we saw was attended by Miss Hunt herself, 100 years young, and still recalling a trip she made with Jean Harlow and Robert Taylor to meet FDR in 1937 on behalf of what would become the March of Dimes. Living history. This film should be essential viewing for anyone interested in Golden Age Hollywood and equally important as inspiration to lead a deeply fulfilling life.